The 12-month forecast ending December 2018 (below) indicates primarily moderate deficits throughout much of Mexico with exceptional deficits in northern Baja. Deficits may be severe in Coahuila, Tamaulipas, and Yucatan. Moderate deficits are forecast for Guatemala, El Salvador, western Honduras, and western Nicaragua. Surpluses are forecast for eastern Honduras, Costa Rica, western Panama, Jamaica, and central Cuba. In the next few months deficits in Baja, Mexico will remain intense, with exceptional deficits emerging in the south while those in the north downgrade to severe. Severe deficits will also emerge across the Gulf in northwestern Sonora. Moderate to severe deficits will continue to emerge in Chihuahua, Coahuila, and northern Durango. 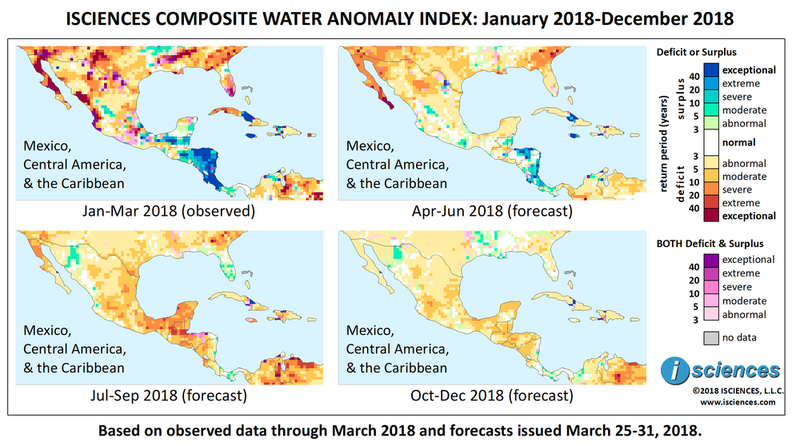 Relatively normal water conditions are expected in southern Mexico, with mild deficits emerging in Yucatan. Near the US border, surplus conditions may re-emerge in northern Nuevo Leon. Moderate surplus will persist in southern Zacatecas and Aguascalientes, and will emerge in a pocket of southern Oaxaca. Surpluses in Central America will shrink considerably but persist in Belize, eastern Honduras, southern Nicaragua, Costa Rica, and western Panama. Some moderate deficits are forecast for central Guatemala and western El Salvador. Intense surplus conditions are forecast for Jamaica and central Cuba. Deficits in western Cuba will downgrade to mild. From July through September, deficits in southern Baja will nearly disappear and but remain severe in the north, shrinking slightly. Deficits in northwestern Sonora will downgrade to mild, and moderate surpluses may emerge nearby along the Rios Yaqui, Bavispe, and Batepito. Moderate deficits are forecast from Nuevo Leon and Tamaulipas in the northeast, leading southwest into central Mexico and through Guerrero, with some severe pockets. In southern Mexico and through the Yucatan severe deficits will emerge. Deficits may reach extreme intensity across central Guatemala, and primarily moderate deficits are forecast from there through northern Costa Rica. Some areas of moderate surplus may persist in central Panama. Jamaica will transition from surplus to deficit and moderate deficits are expected in eastern Cuba and Haiti. The forecast for the final three months – October through December – indicates that deficits in the region will downgrade, becoming mild to moderate. Puerto Plata, a northern province of Dominican Republic, experienced flash flooding in mid-March after 272.8 mm (10.8 in) of rain fell in a 24-hour period, nearly doubling the prior record for March. Over 500 homes and businesses were reported damaged. In early April, following torrential rains and flooding in the central province of La Vega, 4,000 people were evacuated and nearly 900 homes were damaged. Martinique was also hard hit by severe flooding as 250 mm (9.8 in) of rain fell in a 6-hour period. There were no fatalities but flooding caused power outages for 9,000 households and temporarily trapped 1,200 students and teachers in their school until flood waters receded. The first quarter of 2018 has been the fifth driest quarter in 77 years for Baja California, the northern half of Mexico's Baja Peninsula, with 80.5 percent of the state affected, including 22 percent in severe or extreme drought. Conagua, Mexico's national water authority, estimates that by the year 2035 the supply of drinking water in the region will decrease by 21 percent. Reduced inflow from the Colorado River is expected to exacerbate the problem. Conditions have been especially difficult in the cities of San Quentin, Ensenada, Tijuana, and Rosarito. San Quentin, whose aquifers have become highly salinated, is creating an irrigation district with desalinated seawater.